Bringing home a baby can be both a fun and challenging experience. This is especially true when you are already a pet parent! So what should you expect? How should you prepare? And what does that first introduction look like? We recently sat down with two experts to talk about their personal experience and advice to new parents! 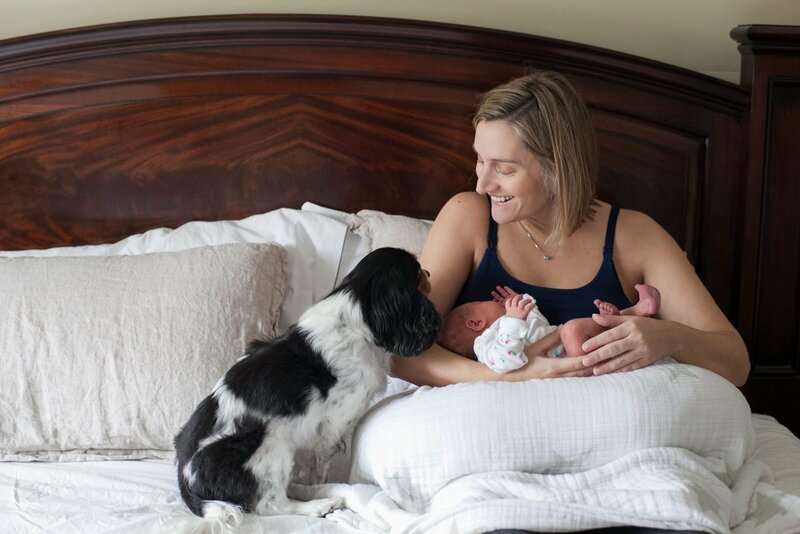 We recently spoke with Katie, the owner and founder of Windy City Paws, to talk about her experience bringing home a new baby while introducing her daughter Cosette to her dog Mia in 2015. We also spoke with Melissa Klett, an animal behaviorist at The Anti-Cruelty Society and dog trainer with Collins Canine, to discuss her experience and advice to new pet parents. 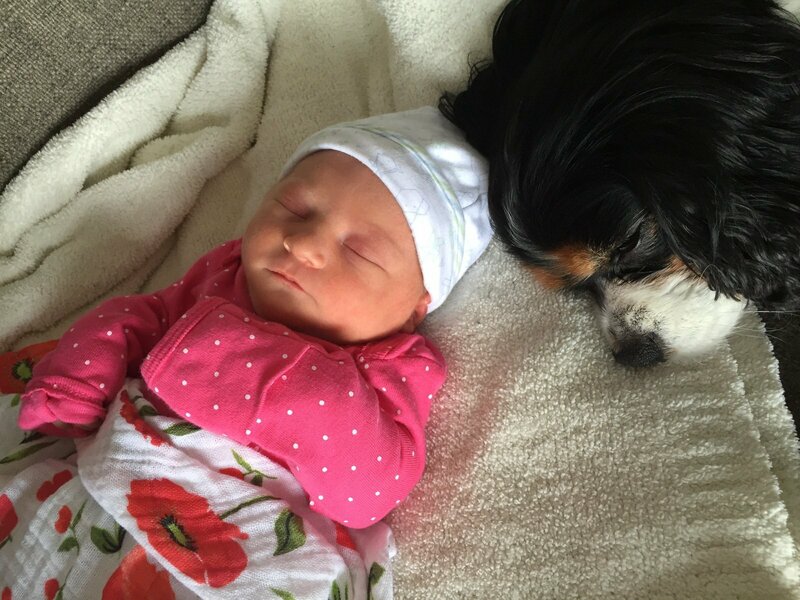 When should I start preparing my dog for the new baby? Katie—I started preparing early, in my 2nd trimester primarily. Every time I was in the nursery setting up the crib or decorating, I had Mia with me. I took her to a pet supply store and let her “pick out” some new dog beds. I wanted to make sure she had one in the baby’s nursery and play areas so that she felt she had a safe space no matter what room we were in with the baby. Throughout my pregnancy, I continued to keep Mia close, make sure she got plenty of attention and exercise. Melissa—It’s never too soon to start. Even when just in the planning stages for a child, future parents can condition their dogs to the sounds and movements of toddlers and children by walking and sitting by parks, day cares, etc. and giving them things they like (treats, ear scratches, squeaky toys). Once it is known that a baby is on the way, necessary changes can gradually be made. For instance, the dog’s bed can be moved, toys stored more securely, walk schedules can be slowly shifted. Katie—I spoke with my vet to see if she had any suggestions for things that I should do to help prepare. She recommended that I get the baby’s things out early and put them in common spaces so that Mia would get used to them and not be scared, but also to help establish boundaries. Some baby toys look a lot like dog toys so I let her explore and sniff the baby’s things and I’d praise her verbally and with treats when she would explore but ultimately not disturb all of the baby’s things. Melissa—Again, never too soon. Ideally, strollers, diaper bags, and other paraphernalia should be left out as part of the background of a room in which the dog is already relaxed. 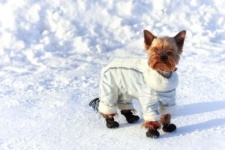 Depending upon the dog’s comfort level, these items can be visible for a few days and then make occasional reappearances or, for the more nervous dog, remain out until the dog becomes accustomed to them. Praise and reward the dog for appropriate interest in the items (sniffing or looking). The gear will need to be placed out of reach when unsupervised if the dog tries to chew on or play with it. What can I do to help my dog feel less jealous? Katie—I was a little worried about potential jealousy. Mia was my first baby and she’s always been the center of my attention- she’s never needed to compete with anyone for my affection. I’ve also had a few friends who had experiences with their dog going to the bathroom indoors or barking a lot once the baby arrived, so I wanted to be more proactive to avoid that. I really wanted to keep Mia’s routine consistent. When I was too pregnant to walk Mia (and for about a month after Cosie was born), I had a dog walker come daily so that Mia still got all her exercise each day. I think that really helped keep her happy and healthy. What should I plan to do when the “birth-day” arrives? Katie—I planned for a home birth but also had an emergency plan for a petsitter to watch Mia should I need to go to a hospital. I had full instructions, plenty of dog food, etc. all ready. 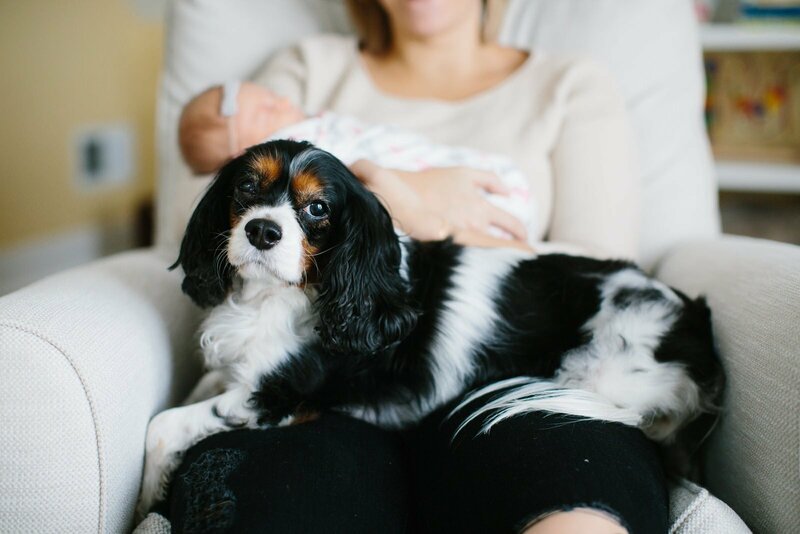 If you are not planning for a home birth, it is a good idea to have a plan in place for who will be watching and caring for your fur-baby while your new baby is making his or her arrival! Having a list of who needs called and what needs put into action long before your due date will help prevent panic should you go into labor early and ensures your pup has the care he or she needs! 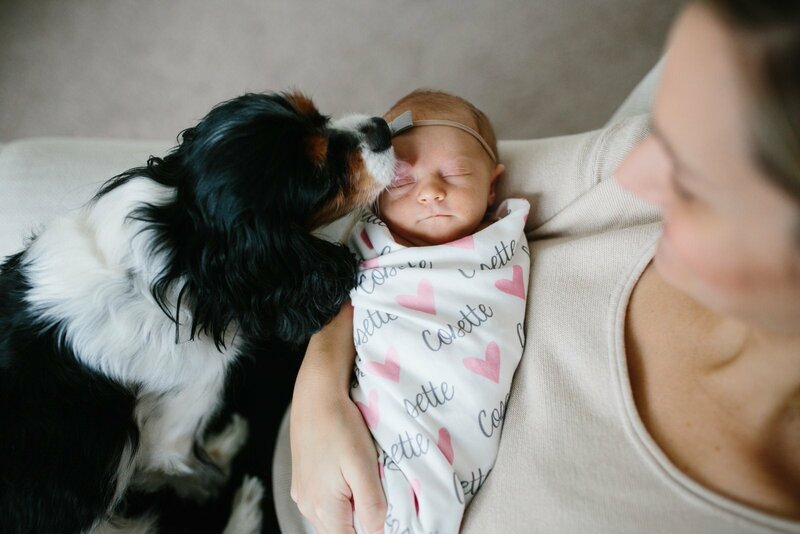 How I do welcome my baby home and introduce him or her to my fur-baby? Melissa—Send something home with the baby’s scent on it ahead of time. Encourage the dog to sniff it while praising, speaking in a happy voice, and/or treating the dog. 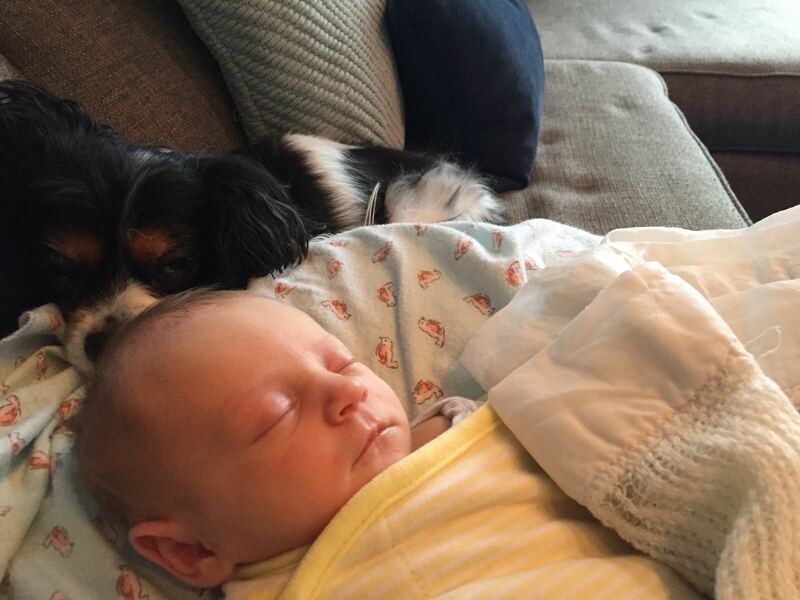 Introduce the baby at a time when the dog has been fed and exercised and is relaxed. 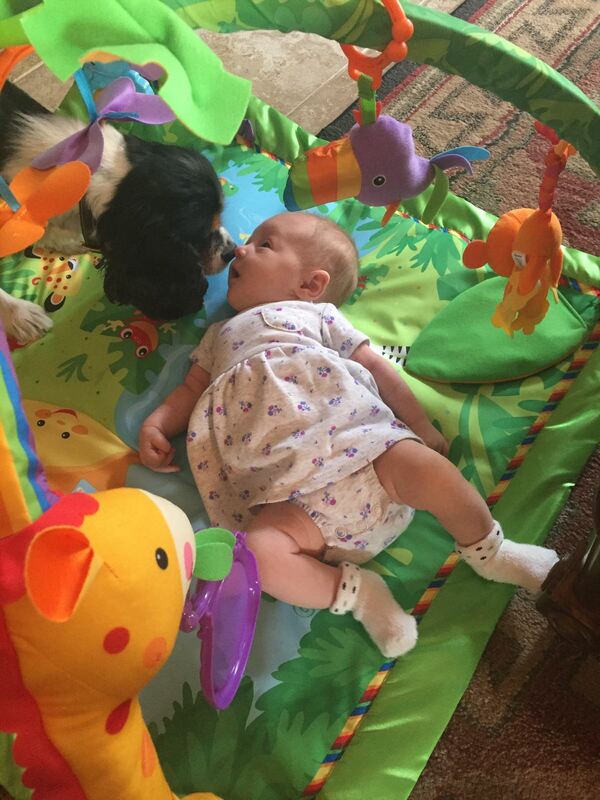 Don’t force the dog to look at or sniff the baby and don’t be tense or anxious about the interaction. Keep the dog on leash if there is any concern he will be too exuberant or rough in his investigations. Be sure at least one person is assigned “dog duty” – this person’s sole responsibility for the time is to address the dog’s needs. This helps to prevent confusion or stress by people trying to juggle the needs of mom, baby, and dog at the same moment. 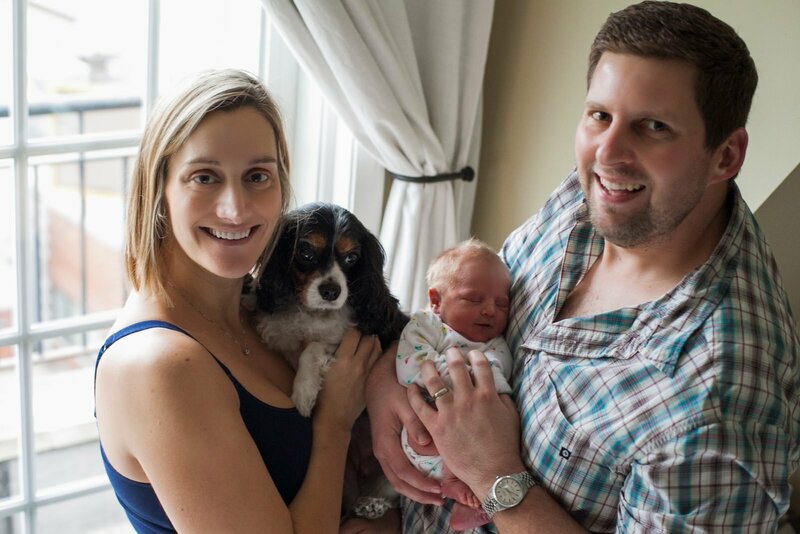 Katie—I had a home birth so Mia was there during my entire labor at home. She actually slept through most of it!! Shortly after Cosie being born, we introduced Mia to her very gently. We picked Mia up and put her on the bed, close to Cosie while we were holding her. We wanted Mia to smell her and see us holding her. Mia was very gentle and interested. She gave Cosie a lick on the cheek pretty quickly but then ultimately backed off- somehow she seemed exhausted! But also it helped I think that we were at home- in an environment that she felt comfortable in. My veterinarian recommended that once the baby was born, I put something (like a blanket) in Mia’s crate that had the baby’s scent on it. I put a small blanket in Mia’s crate and then on the couch next to me when Mia would cuddle up next to me. In the following days, we continued to put Mia close to Cosie but in a way that we could control. If Mia were a larger dog (she’s only 17 lbs) or aggressive in any way, we would’ve used a leash for the introduction. We also continued to call on Mia and give her lots of her usual attention and exercise. What should I do to make sure the transition continues to go smoothly? 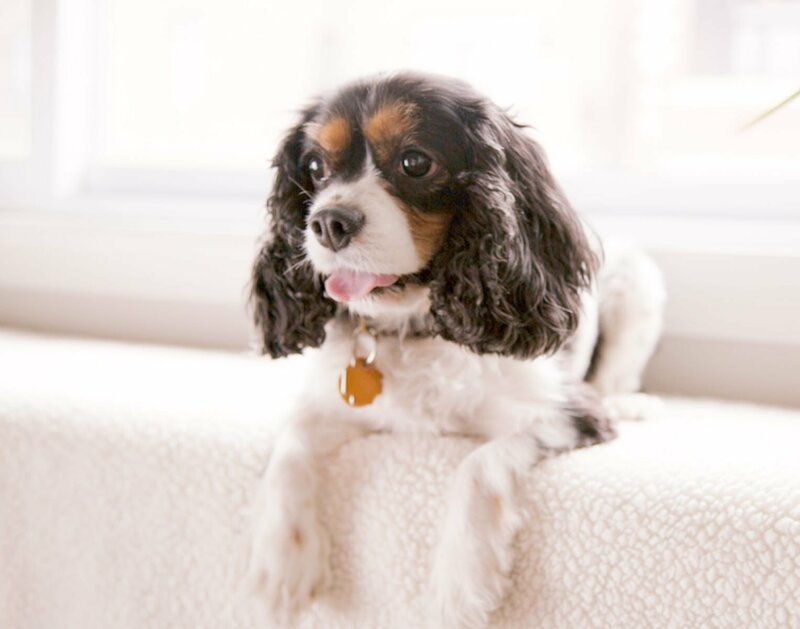 Melissa—Owners should listen to their dogs! If a dog is giving signs of being worried, he should not be forced to “deal with it.” Never punish a dog for letting you know that he is stressed. Get help from a trainer to teach the dog to be comfortable and accepting. Growling and baring teeth are the obvious concerns. Parents should also be aware of any behavior changes in their dogs, such as a decrease in appetite, becoming withdrawn, an increase in chewing or destructive behavior, etc. They should also closely monitor body language. Watch for the dog becoming tense or moving away when the baby is around or crying. Anything unusual warrants at least a consult with a trainer. Katie—I was most concerned that Mia would act out in some way once the baby arrived. I thought she could revert to puppy behavior and destroy things or start going to the bathroom in the house to show her unhappiness over the situation. I thought Mia might be sad or anxious with a new family member, she has separation anxiety already so I assumed that could just get ramped up as well. My concerns never happened. Mia was curious, gentle, playful and calm around Cosie from day 1. She followed me around more than usual- I think to protect me but also to be a part of everything. I went out of my way to call Mia over whenever Cosie and I were in a different room. I called her into the bathroom when I was bathing Cosie. I called her to sit next to me on the sofa when I was nursing Cosie. I’ve always talked to Mia during the day so I kept doing that, I’d tell Mia what I was doing with Cosie and then pet her and tell her she was a good girl for helping keep guard over Cosie while I was bathing her, etc. My advice to any new parents is to start preparing early. Let your dog get used to all the baby swings and toys in your home. 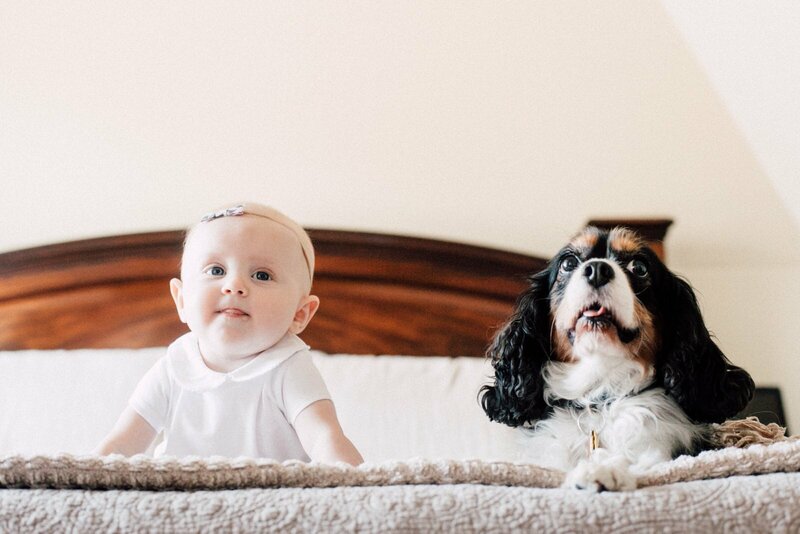 Make sure your dog can be included and comfortable in different rooms of your home when you are with your baby. Maybe you need an extra dog bed or a towel to put on your bed or couch something else to make your dog comfortable? In my experience, the more your dog can be a part of your parenting journey, the happier and more consistent their behavior will be. If your dog has any aggression or is super timid, I’d seek out a trainer during your pregnancy to help work on techniques. Once the baby is born, you’re too exhausted to do anything too extra for your dog (like start a training class) for a while. But if you’ve been using those techniques for months, you’ll easily be able to keep reinforcing those behaviors. Also, as your baby grows and changes, their relationship with your pup will change. Now my daughter is 13 months and she’s best buddies with Mia. Her 3rd word was “Mia.” She lights up when she sees her and is used to Mia being in the same room as her almost all the time. Through Cosie’s crawling, walking and fur pulling- I’ve been there to supervise and correct Cosie’s behavior when needed or allow Mia to have a safe exit out of the room. Make sure your dog always has a spot in the home where they can escape the baby if needed. For me, that’s a crate in our bedroom. Mia can always escape there and feel completely comfortable. Get to know your dogs cues so that you can intervene to help if needed. Do you have a food aggressive dog? Then you’ll need to think about feeding times and maybe keeping your dog out of the kitchen during those times. Cosie drops food or “hands” it to Mia all the time- sometimes I can stop it and other times I can’t. If Mia was aggressive with food though, I’d have a different plan. Also, I never practiced walking Mia with a stroller. I wish I had done that before Cosie was born because once I needed to get out with a stroller and Mia, I found that a bit challenging. If your dog isn’t the best at staying to one side of you or has any leash aggression issues, start practicing! I ultimately used the baby carrier a lot more in the first few months because managing the stroller and leash was tough at first! Bringing home and introducing your new baby to your dog is a special moment in any pet parent’s life. By putting some thought and preparation into the moment, you can make sure that everyone stays happy and enjoys the new addition! A huge thank you to Melissa Klett, we applaud the amazing work she does with The Anti-Cruelty Society and Collins Canine!